I was so, so happy to get back to work today after being off for 3 weeks (four if you count March break). I opted to do a couple of half days to start, as I'm still not myself. The morning was great; I caught up with my students and got quite a bit done. It felt good! By late morning though I was starting to sag and I could barely drive home and eat lunch. The afternoon was spent lolling, dozing, reading and sketching on the sofa. Here is a picture of the 4 by 8 page that was done for me by Charlotte. I have to say that I am very excited about the next month's theme which is 'speckled eggs'. I was inspired right away and started something on Sunday. I love it so far, but I cannot show it. Darn! 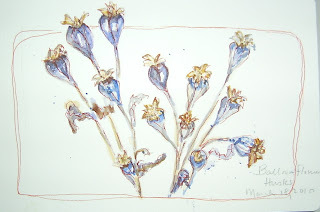 I will say though that part of my inspiration came from this blog and her piece dated March 25th called 'Sparkle'. 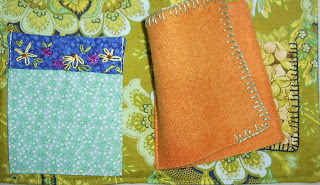 I have a supply of note cards that i have printed from my postcard size quilts. I thought it was the perfect project for them. I am very slowly coming out of the fog I've been in for the last few weeks and plan to get back to work on Monday. Yesterday, I had two lovely visits with friends. The first one involved tea, corn bread biscuits with maple syrup (she and her husband make it themselves), and lots of creative chat. This special friend, Nicole, makes recycled art. I just had to come home with one of her new bags. She has not joined Etsy yet, but perhaps will soon. Her things are amazing. Next, a friend dropped by for lunch; she wanted a little advise on a project. 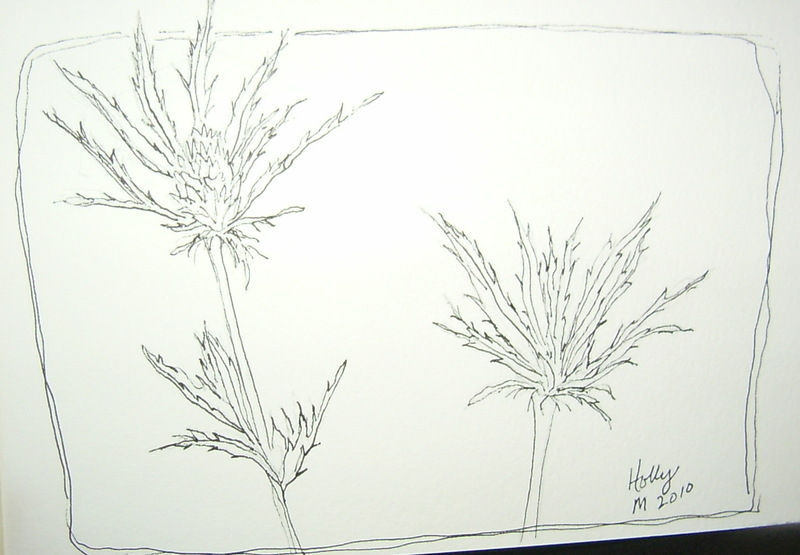 The flowers she brought were so different, I just had to sit down with pen and sketchbook after she left. 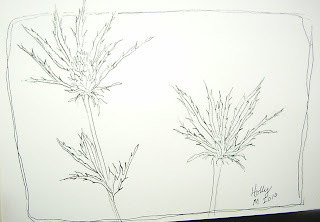 I do plan to add color to it, and I'd love to make a stencil to print it onto fabric. Aren't they different? She didn't get the name, but it's supposed to be in the strawberry family. 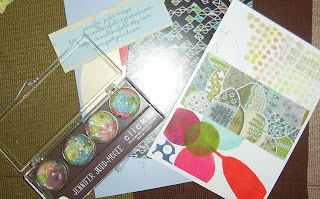 I then rested for the afternoon, as it was the night to meet my little group of 3 creative journal friends for our first swap. We met for only 45 minutes at Tim's for supper, as our time was limited, but we made the swap and chose a theme for the next month. It is going to be 'speckled eggs' --any media-- and we have 2 more people joining in. We don't want it to be a big project or a stress-- the page is supposed to take an hour or 2 at most, but it's a nice way to connect with friends and get those creative juices flowing. The pages that we swap are about 4 by 8 inches and are meant to be experimental. The idea is try something you might not have tried before with no stress. The first picture is of the one I did--the theme was 'melting'. 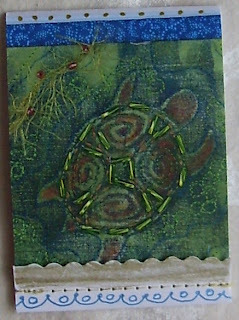 It is done on white cotton, mono printed, Inktense pencil work added, and mostly embellished and hand stitched. The next picture is the one that my friend Nicole did. I haven't taken a picture of the 3rd one by Charlotte yet, but I will. 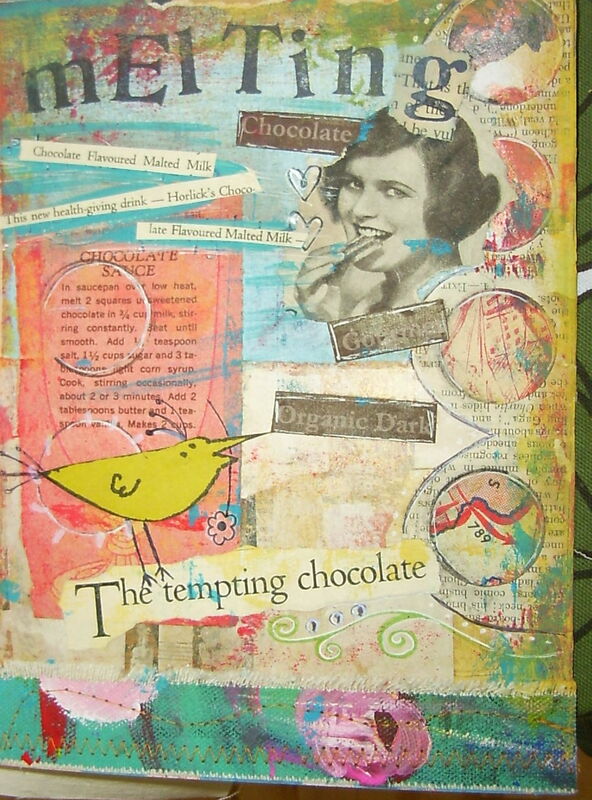 She has done hers in a collage/journal style. I'm off work still for this week, but I'm coming along. 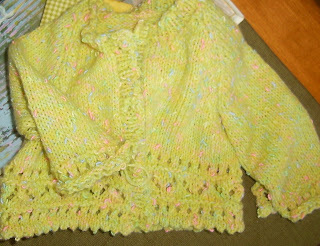 Since I've been doing a lot of sitting, I did knit a baby sweater as well. I'm not quite finished sewing all the seams. Little sweaters are so fun! Isn't it funny how when you're home it's almost exciting to check your mailbox each day? I was so excited today to find a little parcel in mine! 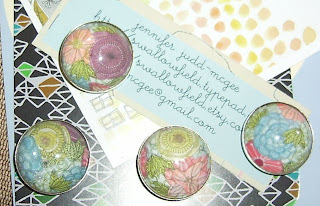 It is a set of frig magnets that I ordered from one of my favorite bloggers, Jennifer Judd-McGee. 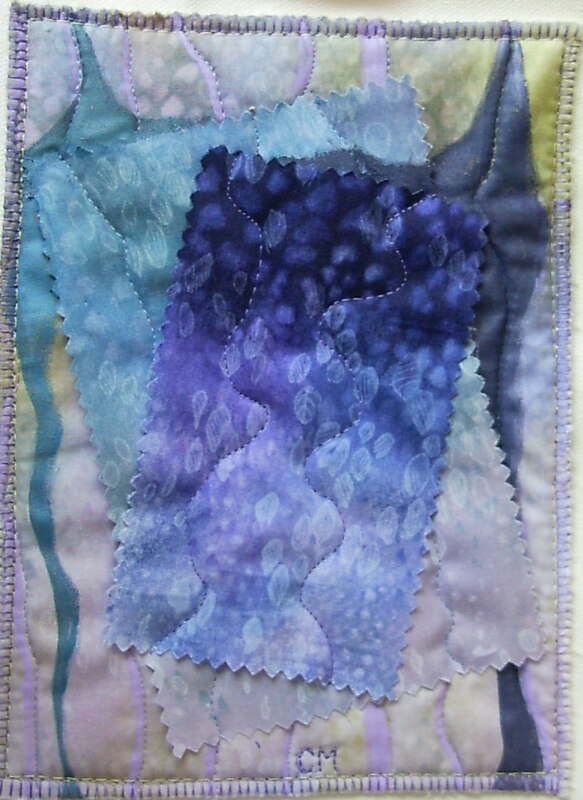 I am continually amazed at the thoughtfulness of artists and quilters who blog. You can see in the picture below the little extras that she included in the package. 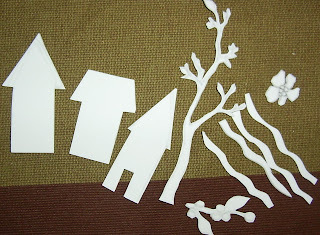 Melanie Testa, (her blog is on my sidebar) who wrote the book Inspired to Quilt has gotten me started in cutting out foam stamps for my art quilts. I have used foam for stamping for a long time actually but I've never mounted them as she has on Plexiglas. This is a perfect little project for the sofa as well. I haven't mounted them yet, nor are they all done. She is right it is addictive! 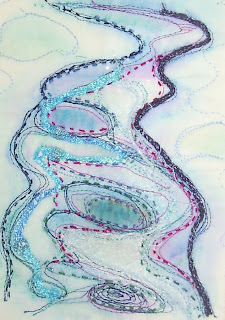 I have more ideas and I can't wait to be able to have the energy to try them out on fabric. on my little sewing case. I added lots of little details, and it was fun to do. Today, just by my front walkway where the snow is quickly receding, I found and picked these balloon flower husks. I grabbbed my new Moleskine sketchbook and my little travel pack watercolor kit, stretched out on the sofa, and did this little sketch. I was so happy to be inspired to start a new page in my sketchbook only to discover that I had done it on the last page and upside down. Oh well. I had a re-check at the hospital yesterday for my lung function and the doctor this time was quite knowledgeable about Addison's disease. The lung function test showed no improvement; he advised me to take more prednisone, and if I'm not better by Sunday they will admit me for an IV. I keep thinking I feel better in the morning and then I crash. He did tell me to try a 20 min walk; instead I went to the salt water pool and whirlpool at a spa 5 min from my house. I did a little paddling around with some belly breathing and soaked in the hot tub. Afterward, at home, I made I quick lunch and promptly fell asleep. Later I started wheezing again. 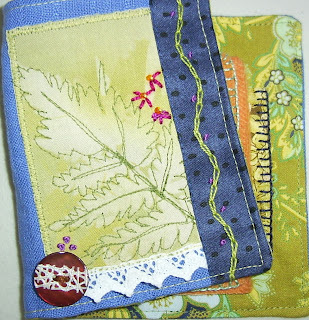 I stayed stretched out on the sofa and did the final touches to the little sewing kit. I realized that I forgot to sew in a ribbon to tie it closed, so I will probably add a button or snap closure. I have a tiny bit of blanket stitch on the wool felt pages. Would you believe I put what little energy I had today into this little gift and it's still not finished? Well, it is typical of me, even when I'm not sick. I do like to fiddle, try this material and that thread. I like to get caught up in the little stitching details sometimes. 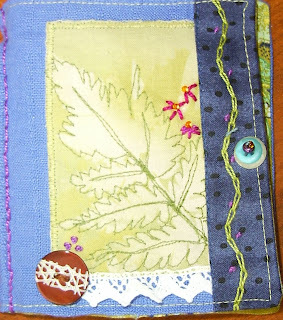 The little pocket is going on the inside along with a felt page for needles. It was before 5AM when I awoke this morning with my head full of things I could do from home to connect with some of my adult students, so I made tea, wrote a list, and got up at 7 for breakfast. The teacher that works me with had dropped off my work laptop yesterday, so I booted up and caught up with email. By 9AM I was exhausted, and for the first time since this started, I curled up on the sofa and fell asleep. I did venture out on one errand after lunch to buy some more perle cotton. Then I had to come home and rest again. 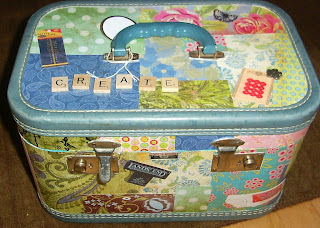 This next photo is of one of my favorite things--my converted antique overnight bag, filled with essential art supplies. I keep it near my chair in the living room for when the creative feeling hits. One of my goals this summer after I finish work is to set myself up an Etsy shop. I don't produce a large quantity but I need to be creative and I need an outlet for what I make. 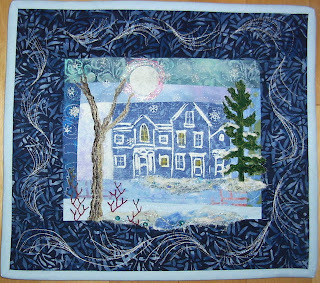 Up until now I have sold at a quilt show and in a local art gallery. This is my latest wall hanging that I have finally put all the finishing touches on. It is about 13 1/2 by 15 1/2 inches. It started with a hand drawn stamp and fabric paint. 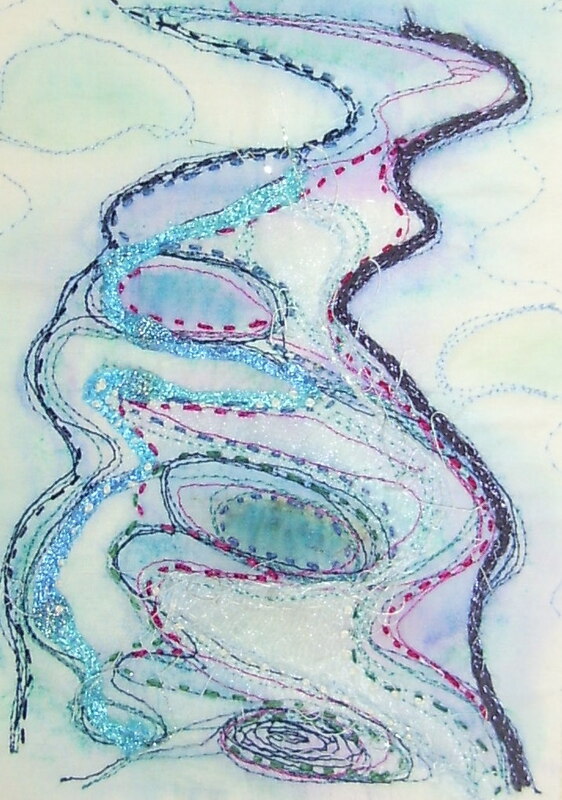 There are Angelina fibers, machine stitching, hand embroidery, applique, wool fibers, and beads. If anyone is interested in purchasing it, you can email me. This is just a quick update--no pictures. I went back to emergency and at least had more tests with a diagnosis of bronchitis and a touch of pneumonia. So, I started some antibiotics last night and am now using 3 puffers. The breathing problem is finally easing, but I'm hurting all over and exhausted. I did some more hand quilting today. Hopefully, the next post will have something to show. I am still not feeling well--simply cannot get the cold out of my chest and breathe normally. I've been languishing for days with nothing but my hand quilting. Today I felt the creative urge to do something different, and so, using my computer chair to wheel myself back and forth in my studio, I started this little needle case cover as a gift for a friend. 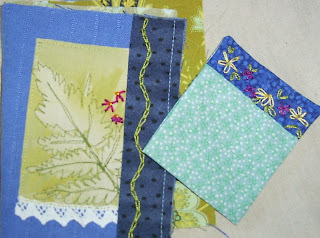 I plan to sew in the lining (after I add a pocket), and then I will add some felt for the needles. Perhaps I'll add a few beads and the button that is shown. 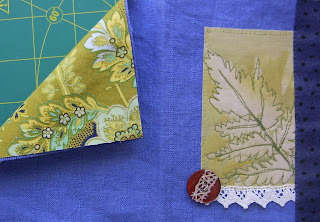 The fern fabric is a piece from a hand painted fabric that I sun printed. I didn't even do much hand quilting today...spent 5 hours at the hospital. At least I don't have pneumonia. I've doubled my prednisone and am using 2 puffers as well, but to-night I'm not comfortable at all. My chest is tight and my breathing is difficult. 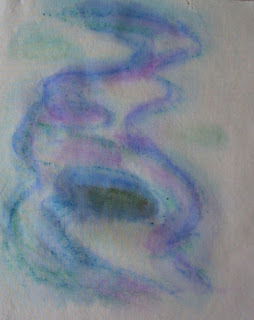 As an attempt to relax, I had a warm bath and after in my studio, I played a book on CD, The Lacuna, for a little while. I did this little doodle which is quite odd and as you can see, I can't quite figure out which way it goes. I'm to be off work til Monday; I sure hope this improves soon. I'm home from work today as the cold is in my chest. While I'm not exactly happy about it-- I always worry about bronchitis or pneumonia with my lungs-- I can at least curl up in my sewing room with some hand stitching. 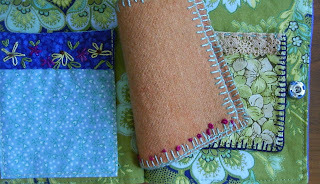 The picture at left is a detail of some hand quilting. 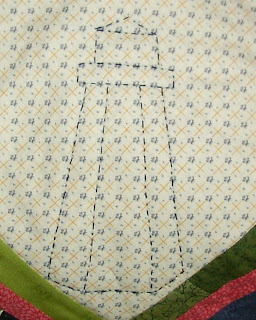 I have moved out into the corners of the tone-on-tone with navy Perle cotton thread to do 4 lighthouses. 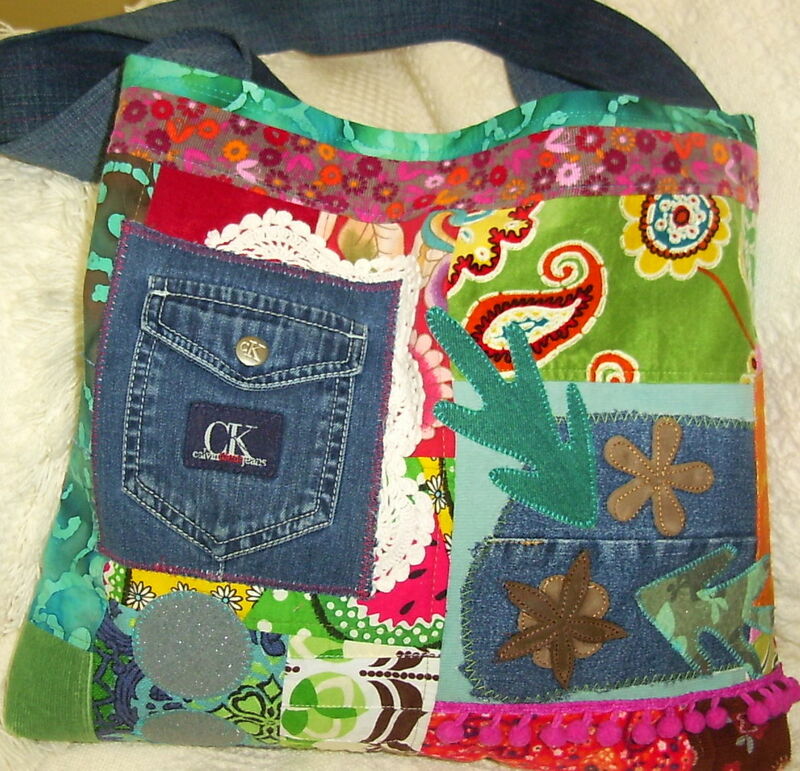 I got the idea for this from the book called Quilt & Embellish in One Step by Laura Potter. To see more details of the book check it out in my sidebar in Good Reads. I'm trying to decide what to do next. One thought is to do a machine quilted motif, perhaps waves and fish. Another one is to do just water or perhaps scallop shells. 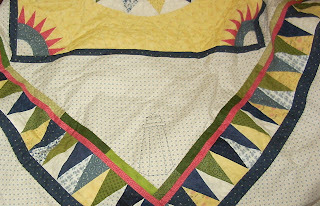 Do I hand quilt or is it OK to mix in machine quilting? 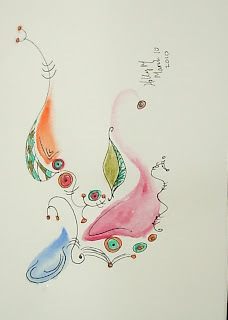 Here's a mono print I did the other day using my Inktense pencils and a water spritzer. I drew with the pencils on a piece of primed wood, spritzed with water, laid the white cotton on top, spritzed it some more and rubbed. Hang it to dry. I'm using it for a journal exchange project. Here is a little peak of part of the finished project. I want to keep the rest hidden until we reveal at the exchange. The picture above is taken from the balcony upon arrival the first night. We came home a day early because I caught the cold that my husband had before we left. Luckily I had a few good days of skiing. 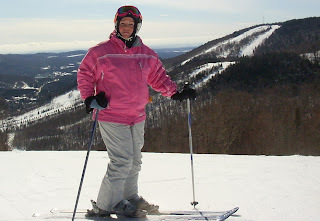 My husband wasn't feeling great on our first day so we just did a few easy runs on the slopes and stopped at lunch time. This is me at the top of one of the mountains. It's odd to see myself myself without glasses. I actually wore contacts everyday for the first time in my life! It's so much easier with the goggles. We had a studio apartment, so I was able to take all our meals. It is so nice to ski up to the door, go in to peel off the wet cloths and have a home cooked meal. 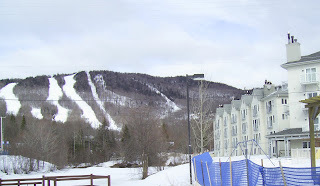 Here's a view of the condo with one of the mountains in the background. In the picture above, I'm standing at the very top of the mountain pictured below. It was sunny every single day-- almost too warm really. One afternoon I even did a quick pencil sketch at the top and I added the watercolor later in the apartment. Their snow was melting and it got difficult to ski after lunch each day. That's when we rested. The first day while my husband napped I spent about 3 hours at a Nordique spa about 2 0 minutes away. Wow, what an experience. I did the sauna twice followed each time by a dip, first in the icy river (they have a cage off the pier which is cleared of ice) and next in a cold water waterfall pool. There were 3 sauna cabins along the edge of the river bank. After each cycle you go to the rest area to slow your heartrate and rest. Finally I went to the outdoor hot tub and then in for a massage. 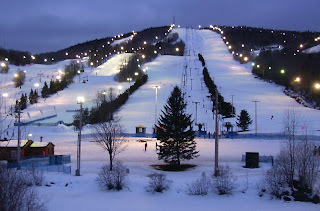 It was a wonderful and unique experience and it really helped the muscles after my first day of ski runs. We had a couple of relaxing ski days after that. 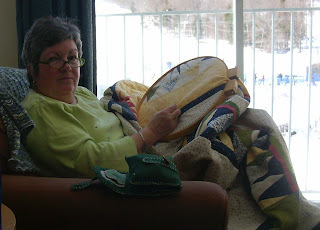 You can see me in this picture handquilting by the window with the ski trails just outside. The double chin is maddening and embarrassing--mostly due to the high dose prednisone that I'm currently on-- but I wanted to show the view beside me.